Dwight was last seen in The Waling Dead Season 8. Some fans believed he'd disappeared forever. But he'll resurface when Fear the Walking Dead returns for Season 5 later this year. Today, we have a first look at Dwight's triumphant return, along with some of his new co-stars on The Walking Dead spin-off series. 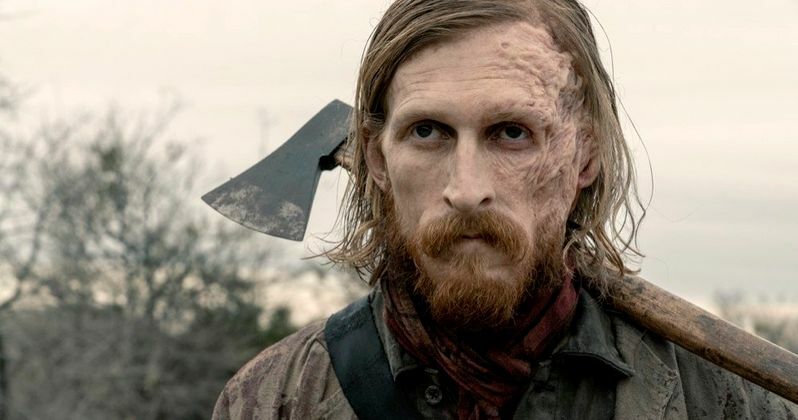 Austin Amelio is reprising his Walking Dead role of Dwight, joining Lennie James' Morgan as the second character to crossover on the sister series. There are no solid story details being released for Fear the Walking Dead Season 5 just yet, but these images give us a pretty good idea of what we're in store for. Seen in the images are Dwight, Alicia, Strand and Morgan. Dwight was Negan's righthand man, staying loyal to the baseball wielding tyrant even after having his face burnt with an iron. Dwight found himself exiled from Alexandria after offering a helping hand in catching Negan, sent off by Daryl, who never wanted to see the guy again. Skybound was the first to offer up these images. These first look photos are teasing Morgan's return, but we don't get to see if he'll cross paths with Dwight right away, if ever. The two were never pals on The Walking Dead, and it's unclear if they'd even recognize each other at this point. The Walking Dead has alway been ahead of Fear the Walking Dead in terms of converging timelines. The two shows almost caught up with each other, but with the most recent time jump introduced in this current season of The Walking Dead, there is now a 7 year gap between the two series. There may be more potential crossovers made possible by the latest Walking Dead time-jump, as teased by the franchise's chief content officer Scott Gimple at this past year's Comic-Con. So surprises are to be expected. Like The Walking Dead, Fear the Walking Dead has no problem dispatching cast members, and almost the entire first season roster has either died or disappeared. And Season 5 looks quite a bit different from those earlier episodes. Fear the Walking Dead doesn't have a solid return date just yet. The Walking Dead just kicked off its Season 9 midseason premiere this past week after offering the first returning episode on AMC's streaming platform on the day of the Super Bowl. You can check out the returning characters here.